Which brings me to the Beatles. Here we are, at the 50th anniversary of their arrival in America. Of their walking down the steps of a jet (would they have used a jetway had one been available, or would Brian Epstein realized the importance of visibility, back in a more innocent time, when people could actually get beyond the TSA screening without a boarding pass?). Of their appearing on the Ed Sullivan show, when they might as well have been more unplugged than the Chili Peppers at the Super Bowl. Lipsync hell. They could have just stood there and shaked their heads on occasion. That would have been enough. A few weeks ago I was in Las Vegas, the place where entertainers go to earn a meal ticket when the grueling life of touring it too much. “Love” is still playing at The Mirage. This reimagining of Beatles’ music will probably be playing at The Mirage long after Donny and Marie give it up due to hip replacement surgery. The Beatles are still with us. But we are without the Beatles. 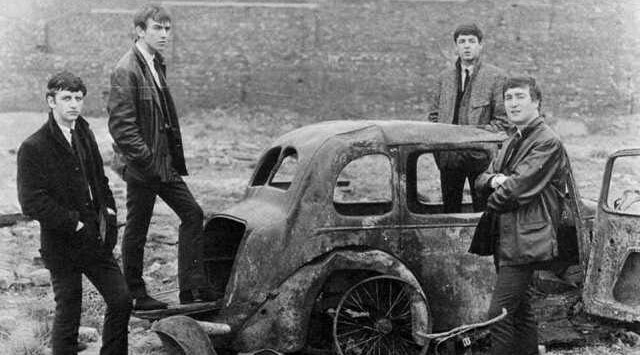 There will never be another band like the Beatles. And in large part, that’s because the band, to gloss Housman, died young. They never became “lads that wore their honours out.” They put out a body of work at a time when there wasn’t an endless drone of alternatives that sound like the opening of “Tomorrow Never Knows.” They pulled the exceedingly neat trick of continuing to create new music and new fans while retaining their old fans. Consider that Meet the Beatles was released in 1964, Revolver in 1966, The Beatles (aka, The White Album) in 1968, and Let It Be in 1970. What would have happened had they continued, had they not had the falling out? Or what if one member left the group to be replaced by someone else? Or if the member left and he was replaced by a series of someones? Would the Beatles have become The Beach Boys? Would they have the veneration and the esteem? Would we be celebrating 50 years in a public way, or would there just be a group of fans who’d acknowledge the anniversary? There will never be a band that will be as big at the Beatles. This is not only due to the proliferation and cacophony that is so characteristic of the music scene now.